The five-hour-long Grand Avenue treat will include tours, activities, performances, and plenty more. 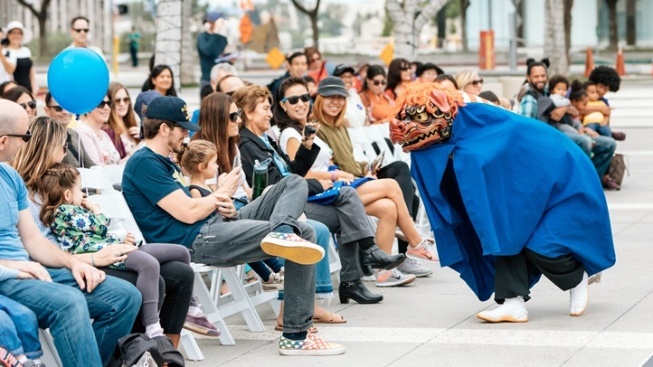 Dance your way to DTLA on Saturday, Nov. 3 for a bunch of free and mind-growing happenings along Grand Avenue, from Temple to 6th. Few phrases hold the allure of "behind the scenes," for longing to know how a dramatic production comes together, or a play is staged, or a music-themed show tunes up, is as powerful a feeling as being swept away by the final result. But behind-the-scenes-y opportunities don't come along all that often, and, when they do, they tend to be one-offs, a single moment tied to a ticket you've already purchased. But Grand Ave. Arts: All Access has a bigger, more generous, more come-one-come-all vibe to it, which means that, no, you don't need a previously purchased ticket to hop onto a docent-led tour of one of our city's best-known cultural venues. The only requirement on your part? Show up, from 11 a.m. to 4 p.m. on Saturday, Nov. 3, and enjoy the many, many, make that super-duper-many happenings at the big, five-hour extravaganza. So extravaganza-y is this free event that, check it out: Visitors will find to-dos that stretch from Temple to 6th Street, along Grand Avenue, meaning there'll be ample chances to stop and hear live tunes, to see artworks, and to hobnob with other local lovers of the arts. A big, heart-filling statement about the day, which is being presented by a caboodle of world-class cultural destinations near and along the avenue, says much: "The range and scope of events taking place underscore the diversity and breadth of museums, performing arts organizations, theatres, schools, institutions, and public venues within a five-block area of Downtown Los Angeles." Oodles of applause for this notion. Oodles. And further applause is due for the "... live music performances, docent-led architecture tours, family-friendly readings and films, educational opportunities, scavenger hunts, exhibition tours, craft-making activities, and free open-house access to many of the participating institutions." Goodness, the tide of mind-filling, spirit-lifting sounds and words shall be strong and high and a delight to experience. Again, this is all free, which is as nice to hear as "behind the scenes." So hop on a tour of a theater or building you love, right there, or join an activity, and soak in the grandeur of this aptly named thoroughfare.